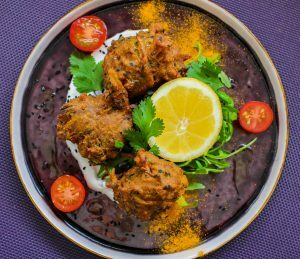 This recipe if fairly straight forward and can be served as a side dish with a curry, as a starter or as light lunch or dinner with some salad. If you’re not comfortable with deep frying you can shallow fry the batter in batches in a frying pan with some oil to make small patties. Grate the courgette into a bowl then add the sliced onion with a generous pinch of salt. Mix well with your hands then set aside for about half an hour. The salt will draw any excess water out of the courgette and onion, giving your Bhaji a less sloppy texture. After half an hour tip the grated courgette and onion onto a clean tea towel. Roll the tea towel up into a roll or ball then squeeze as much excess water as you can out of the vegetables. Place the courgette and onion in a large mixing bowl then add all of the dried spices and the baking soda, mix well. Beat an egg in a mug with the tomato paste and some cold water then add this to the mix. Add the chickpea flour then mix well using your hands. Add water a little at a time, continuing to bring the mixture together with your hands until you reach a consistency a little looser than a cake batter. Take a medium-sized frying pan and half fill it with some cooking oil (sunflower oil for example). Heat the oil to 160C. You can test to see if the oil is hot enough by dropping a small piece of bread into it. If the bread starts to cook (ie bubble in the oil) it means the oil is hot enough. Always take care when deep frying and never leave the pan unattended. Gently drop tablespoons of the mixture into the oil, cooking for about three or four minutes, until golden brown. Try carefully turning the Bhajis over in the oil whilst cooking to get an even colour. Using a slotted spoon, remove the Bhaji’s and place on some kitchen roll to remove any excess oil. Season with salt then arrange on a serving dish with some yoghurt sauce and lemon ledges.